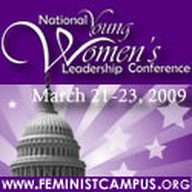 Sponsored by the Feminist Majority Foundation, the 2009 National Young Women’s Leadership conference will focus on the impact young women have when it comes to domestic and global issues. Saturday - FROM CAMPUS TO CONGRESS: EDUCATE, ACTIVATE, LEAD! Join Hilda Solis, Lilly Ledbetter, Dolores Huerta, Tina Tchen, Eleanor Smeal and others as we discuss some of today's most pressing issues, including reproductive rights, the environment, LGBTQ rights, violence against women, communities of color, war, and the economy.